When CicLAvia returns this October, it will be bigger — and organizers hope better — than before. Organizers unveiled the new route this week that includes the same 7.5-mile route from the last two events and new offshoots into Chinatown and the Fashion District. That means that more than 10.5 miles of streets will be blocked off for bikers, roller-bladers and pedestrians on October 9 when the third CicLAvia kicks off. 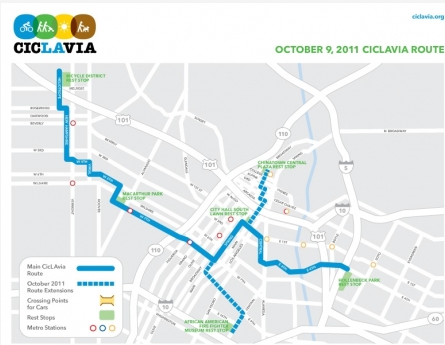 By the early afternoon of April 10, it was clear that CicLAvia had outgrown its original seven and a half mile route. In the urban core of Downtown Los Angeles, bikes were packed so thick on the road that entire groups wouldn’t make it through traffic signals and other road users were intimidated from using the street. Something had to change for the amazing car-free party to continue to attract new riders.